The question of mine was here. I know question without answers isn't prefereable. But this type of questions still relevant. The strange thing is we can find a final answer to question (as I said, the better 5 links). If the problem is with the reputation this wouldnt be the problem, the only thing should change is the admnistrator protect the question. Another argument is if someone come here and ask for a translation, this question will be answered (because it has a goal). But, if another user suggest another translation, maybe, the answer (by the owner of the question) will change to this new one. So, Why not keep this kind of question open (even if protected)? This kind of question is unhelpful? The reason your question has been closed is already given underneath it. As you should be aware, EL&U is a Q&A site. Questions asked here are expected to lead to a specific answer, not cause an extended debate. Your question is too broad and certainly doesn't have a specific answer. Also, it is out of scope for this site. If you go through the above mentioned link, you will seee which questions you can/should not ask on this site. As for the translation related questions, you are mistaken. The page (link above), explicitly mentions "translation and non-English languages" under the category of questions which are not to be asked here. Such questions are either closed or migrated to a sister site. 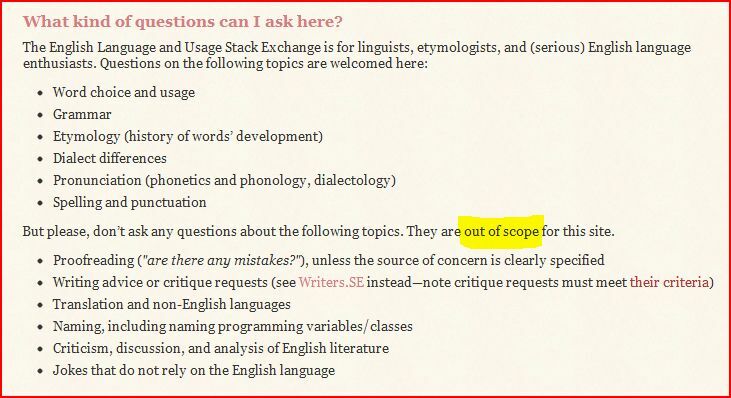 A request for a list of web sites you could use to learn English is a request for a list, which is not a kind of question that is welcome on Stack Exchange sites. First off, that type of list would be rather subjective, as it depends from your knowledge of English; it is also subjective because you would get different answers, if you ask the question to different people. The answers would not be supported by facts, and they would not require a specific expertise. Are there experts in choosing the web site that better helps you in improving your skills in English? Should we consider the creation of a SE exclusive for “Words & Idiomatic expressions”? Should up/down voting be disabled on closed questions?